Overlooking the deep Caribbean sea and majestic mountains of St. Martin, Tequila Sunrise is one of the leading Anguilla luxury villas. 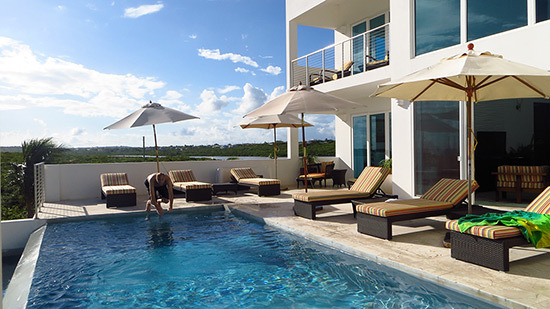 Ideal for families, couples and friends traveling together, Tequila Sunrise provides the privacy and seclusion of a villa rental, and the personalized five-star service and attentive care of a high-end hotel. Designed by international award-winning architect, Sugar George, Tequila Sunrise has 3 master bedrooms, a negative edge pool, a secluded beach, daily breakfast, turn-down service and laundry (and even a cellphone to make traveling around Anguilla even more convenient! ), Tequila Sunrise blends "the best of both worlds" at a high-value price point. Anguilla is tranquility wrapped in blue. No cruise ships, chained restaurants, casinos, mega-night life, swathes of tourists and beach-goers, Anguilla is utterly and blissfuly peaceful and calm. This is where you go to get away. This is where they go to get away... the Uma Thurmans, the Robert de Niros, the Fortune 500s. A decompressed state of mind is sacred. Seeing my parents "there" mentally, is something that gives me great pleasure. That is why, when Robin and Joel Globus invited us to spend some time at their villa, I presented the idea to my parents. They happily jumped at the opportunity. 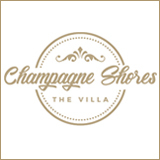 Tequila Sunrise Villa is just 5 minutes away from where we live. At the opposite (Western) end of Long Pond, it offers terrific views of the Caribbean, St. Martin and the double crescent of Long Pond Bay. Truly, tranquility wrapped in blue. Watching my Dad unwind brings a smile to my face. In the photo to the right, you can spot my Dad floating, my Mom with her feet up on the second floor balcony. 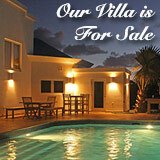 You may know Tequila Sunrise Villa from a story previous told by kind-hearted owners, Joel and Robin Globus. They shared how their home was built. Read about the construction of Tequila Sunrise. When I say kind-hearted, I'm not using a superlative. They are two of the nicest and sweetest people I have met. I knew them virtually, and had shared many emails with Robin, and then phone calls, before ever meeting them in person. 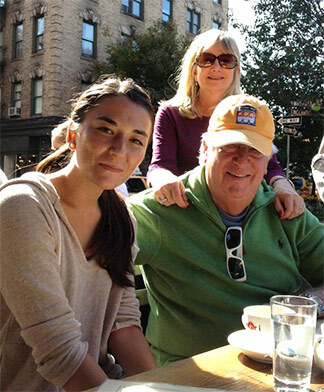 Robin had reached out to me when I announced in a newsletter back in 2009 that Yuki and I were moving to the Big Apple on our own. Even though we didn't know each other in person, Robin sent her phone numbers, in case we ever ran into trouble. Yuki and I were touched by the gesture, and always felt secure knowing she was never far away. Robin and Joel are people who care about people. 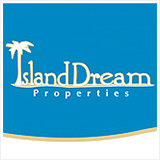 They are driven to deliver value for dollar vacations in their dream home, Tequila Sunrise. 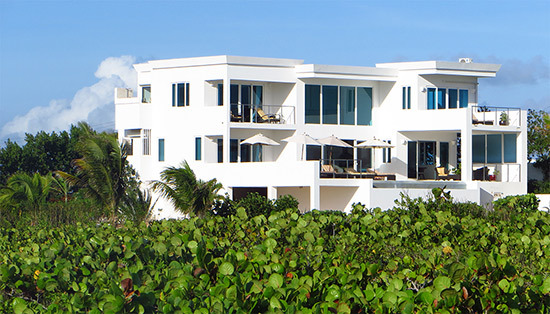 More on Robin & Joel and the story behind Tequila Sunrise Villa. A "love at first sight" feeling struck me as we pulled up to the villa itself. 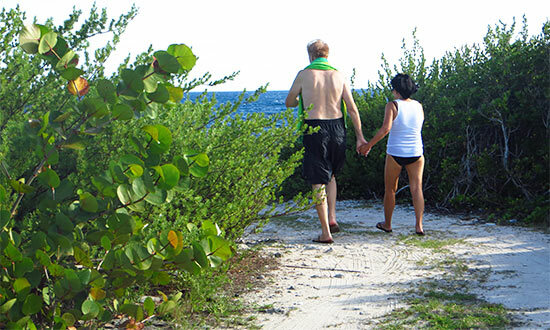 At the end of a long, smooth dirt road, Tequila Sunrise Villa is truly secluded. The white, electric gates closed behind us. Special Note: Tequila Sunrise staff will meet you at your point of entry (be it St. Maarten's or Anguilla's airport) to ensure that you reach Tequila Sunrise smoothly. Stepping out onto the white pebble driveway gave a sense of serenity. The large wooden antique-style doors, set against the stark white walls felt modern yet rustic. A perfect blend. Waiting for us was Kenroy Herbert, the villa's manager. We took to Kenroy right away. His cool, relaxed yet professional and accommodating personality is magnetic! We had a certain kinship for we knew the same pain. Kenroy studied at York University. We've both suffered those cold, Canadian winters. Up the steps and through the doors, the villa's caring housekeeper, Heather greeted us in the open-air courtyard that is just beyond the threshold of the door. She held a tray of chilled, almond-scented towels. Refreshing, they smelled good enough to eat! Speaking of eating, Heather had snacks covered! Tequila Sunrise, the villa, is named after its owners' favorite cocktail. 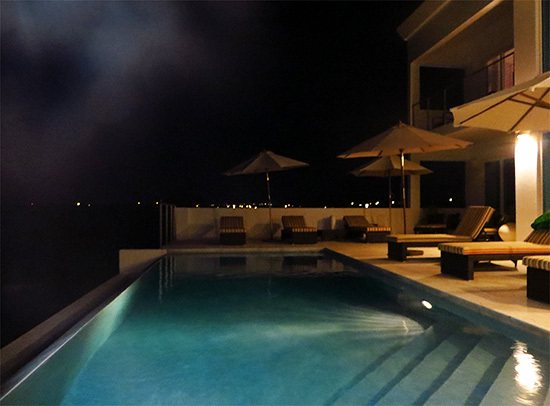 After a stay at this villa, it will be your favorite, too! 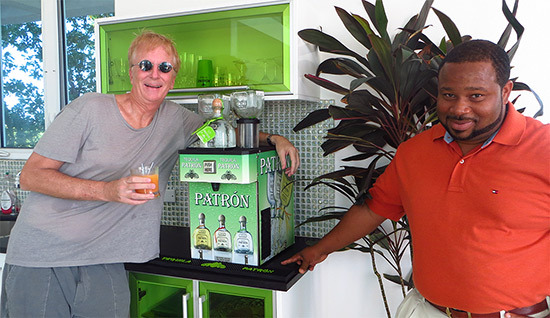 A machine (that my Dad came to lovingly call Mr. Tequila) dispenses unlimited shots of ice-cold Patron tequila. All you have to do is "push here!" My Dad sure was excited to find that out, and cozied right up to Mr. Tequila. It doesn't look like that's the first time Kenroy's seen a guest do that! Snacks and drinks in hand, Kenroy acquainted us with Tequila Sunrise. A stay at Tequila Sunrise Villa includes exclusive, free, full membership at Styler's Gym, one of the very best on the island! It is complete with elliptical trainers, recumbent bicycles, tread mills, Cybex and Nautilus equipment and free weights. Just a 10 minute drive from Tequila Sunrise, staying in shape is simpler than ever at Tequila Sunrise! 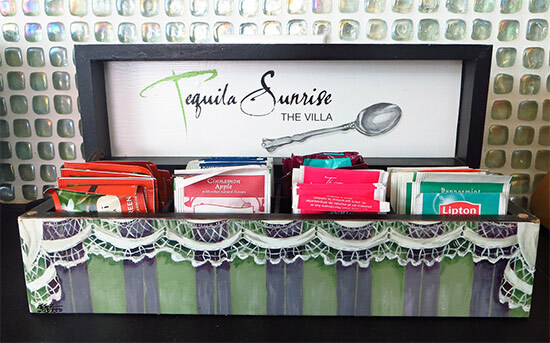 More on Tequila Sunrise Villa amenities. He started by explaining the location. 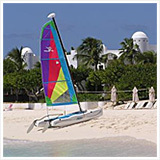 Tequila Sunrise is on Dropsey Bay on the Eastern end of the island's southern shore. Yep, I said southern shore, so you know what that means! 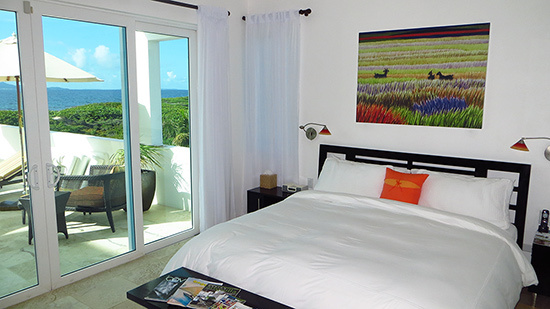 Each room has cool Tradewinds and vistas out to St. Martin. These views are the prettiest at night. Their lights dance in the distance, giving a sense of calm. Knowing this is the Caribbean Sea (the Atlantic is to Anguilla's North), is special, too. There are many restaurants, supermarkets and beautiful beaches close by. 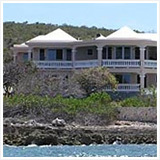 DaVida at Crocus Bay is just a 15 minute drive. Best Buy Supermarket is only 5 minutes away. 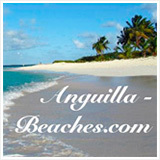 Shoal Bay, one of Anguilla's best beaches, is 15 minutes by car. And of course, it is only a 2 minute walk (we timed it) to Dropsey Bay. The fun part of the tour began! Tequila Sunrise is modern meets Caribbean. 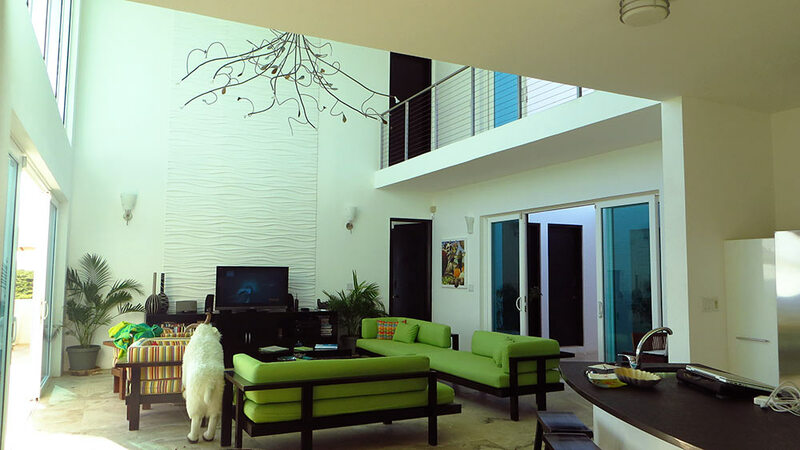 It has a clean, white, fine-line design, and is blended with Caribbean touches. This isn't an overly modern-so-it-feels-sterile villa. It has a certain feeling of home to it while embracing simplicity and efficiency in its design. The main floor is made up of the kitchen, living and dining area, and one master bedroom. The living, dining and kitchen area is open-concept. Breezes blow through, keeping the temperature comfortable and tropical. The Tradewinds remind you of your exotic locale. 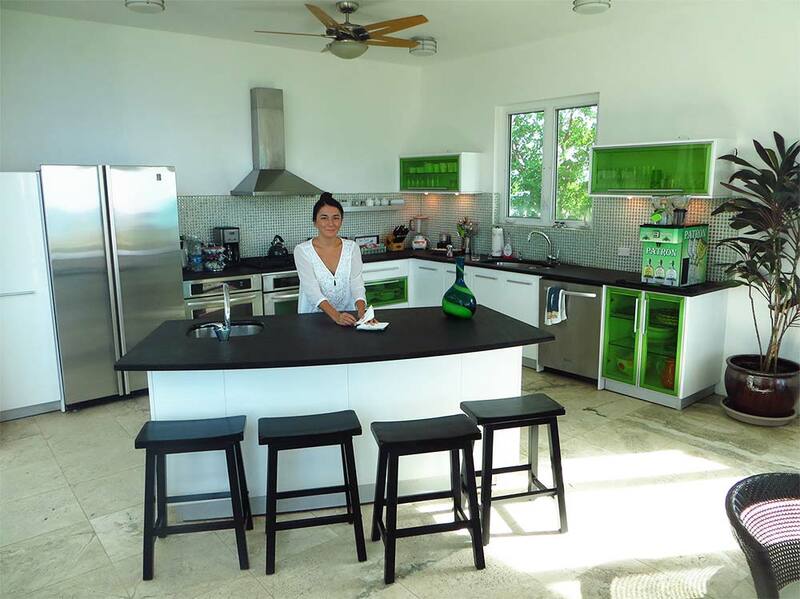 The kitchen is spacious, with state of the art appliances (fridge, wine fridge, dishwasher, oven, microwave, stove). For anyone who enjoys cooking, you have plenty of space. We took a peak inside the fridge. It was pre-stocked with groceries. You can request snacks, drinks, whatever you like and Heather will get it for you. Before we arrived, we didn't make any special requests. "Whatever you happen to pick up," we said. Heather got just what we needed! She made sure we were ready with plenty of water, beer, soft drinks, orange juice, bread and jams. The fridge drawers were full of fresh fruit, too. 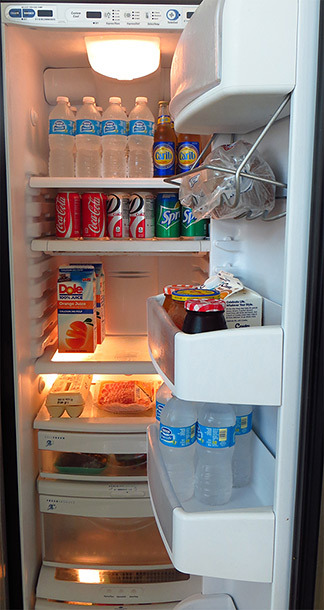 In addition to the well-stocked fridge, there are several options for coffee and tea. You can brew a classic pot of coffee (CuisinArt), or brew by the cup with their brand new Keurig coffee maker (my favorite way to make coffee). 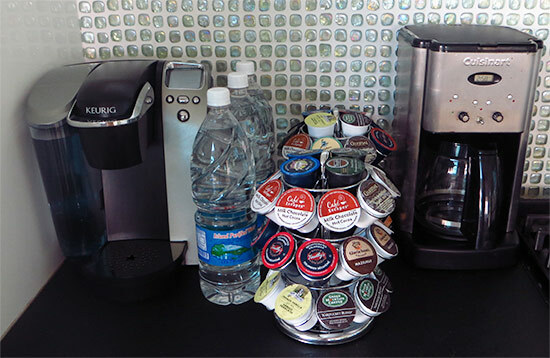 Keurig is quick, clean and convenient. The villa stocks "pods" of all flavors (vanilla, hazelnut, etc.). If you're more of a tea person, you, too have many options. My Mom was in heaven! 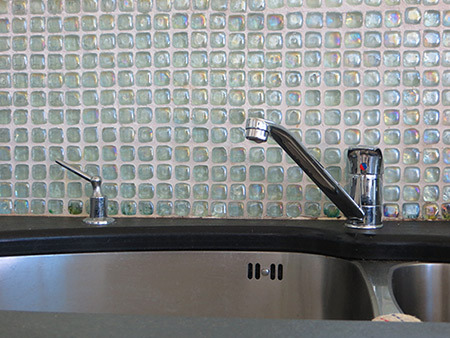 As a side note, the kitchen tiles are the nicest I've seen. They make me think of mermaids' scales. Shimmery and lightly colored, they are tasteful and just right for a home with a contemporary-clean design, accented with splashes of color. The dining area sits by large sliding doors. It can feel like indoor or outdoor living, depending on how wide you leave the doors open, allowing for the breeze to blow through. The kitchen flows into the living room, which has two-storey high ceilings. 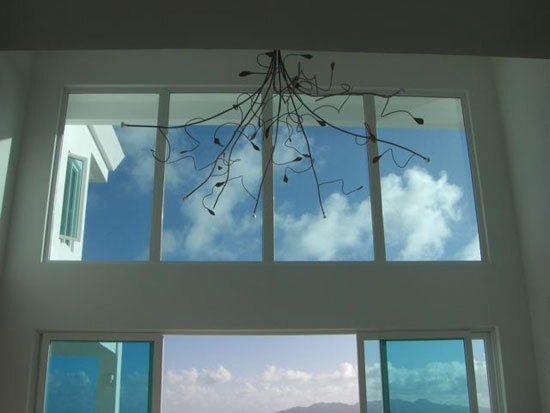 Floor-to-ceiling windows provide stunning views at every turn. An intricate and beautifully hand-crafted chandelier (designed by Joel!) lights up the room in the evenings. 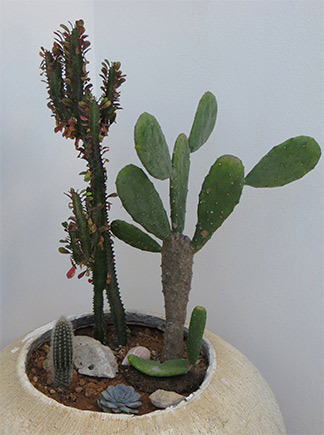 Wide and expansive, my Dad fell in love with the living room. He loved their flat-screen TV. One remote and 1,000 channels. Exactly how it should be! NEW For 2016 Owners Joel and Robin have added a 55" Smart TV with Apple TV. Perfect for quiet nights in, or on the rare rainy afternoon, guests can enjoy Netflix, Hulu, games and much more via the slick 55" Smart TV with Apple TV. Tequila Sunrise also offers a laptop and printer (which makes checking in for your departing flight extremely convenient), an iPod dock and phone with free calls to the US and Canada. The large sliding doors in the living room open onto the pool deck. 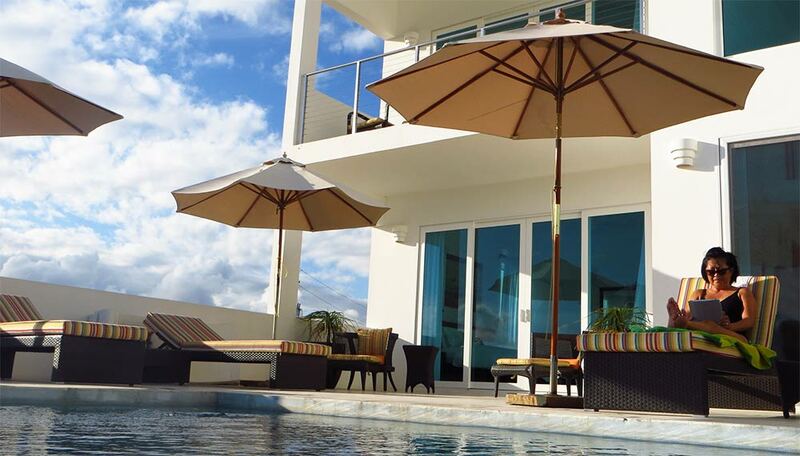 We all loved the outdoor living space, featuring a negative edge pool, six comfortable and colorful lounge chaises, large umbrellas and an outdoor seating area (in foreground of photo). Not shown are the pool rafts (for those who like to drink and float) and their outdoor grill, great for those pool-side BBQs! My Mom and Dad made a special note about Tequila Sunrise's bedrooms. So often when traveling with another couple (or family), you run into the "garden view" problem. For whatever reason, each room isn't built equally and someone gets stuck with the "garden view" suite. That is not the case at Tequila Sunrise! 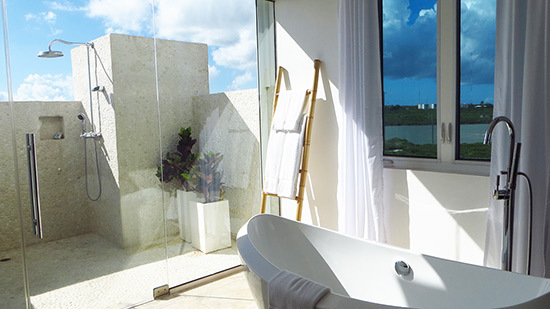 Each of the bedrooms have been built to have spectacular St. Martin views, air conditioning, and an ensuite bathroom. Each also has a full bathtub, outdoor shower and his and her sinks. They all have flat-screen TVs with access to their 1,000 channels, an iPod docking stations and telephones. 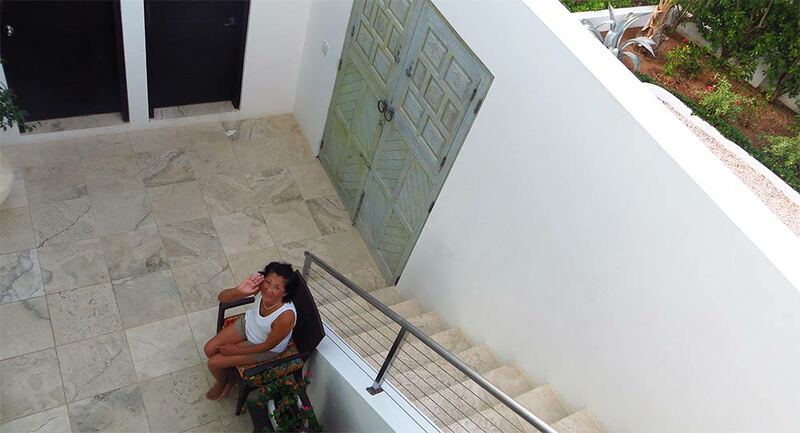 Note: The villa also includes a cellphone that accepts international calls. A very convenient touch! Honey-comb cool and comfortable Tequila Sunrise robes and slippers are in every room. The material is just right for Anguilla's warm temperatures. There is plenty of storage space, and a safe to store precious belongings. The beds are oh-so comfortable. Complete with down comforters and air conditioning, sleep in the lap of luxury, waking up each morning feeling totally refreshed. The blinds are just right, too. Soft and airy, they're delicate, while providing enough privacy (not that you need it). One of the bedrooms is located on the main floor. The other two bedrooms are on the second storey. Here's where Tequila Sunrise gets interesting! In that refreshing space, the un-covered staircase leads to the second floor. The views from the staircase over Anguilla, Long Pond Bay and the salt pond are especially pretty. The second floor also has a set of sliding doors. On the second floor there is an eastern bedroom and a western bedroom, separated by a long walk-way, which overlooks the living/dining/pool areas below. The views out to sea from the walk-way are magnificent. The bedrooms on the second floor are similar to the first floor bedroom, each with their own private balconies. The eastern balcony is extra-large, with vistas of St. Martin and Long Pond Bay. Long Pond Bay has consistently rolling waves. They are fun to watch on a "big" day. The two second floor bathrooms are slightly larger than the first floor bathroom. 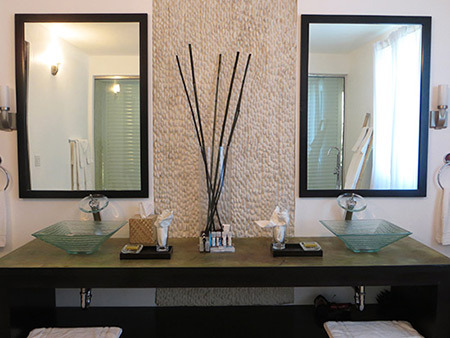 The Italian tile (in all bathrooms) is nicely offset by pebbled flooring that surrounds the large soak tub. This really prevents you from slipping! The wide counter-tops offer all the toiletries you could ever need. Korres body butter, lotion, shampoo, conditioner and soap. You will also find small, Tequila Sunrise flashlights and Tequila Sunrise travel kits. The travel kits include q-tips, a sewing kit and cotton. And if you have forgotten anything, feel free to call Kenroy. 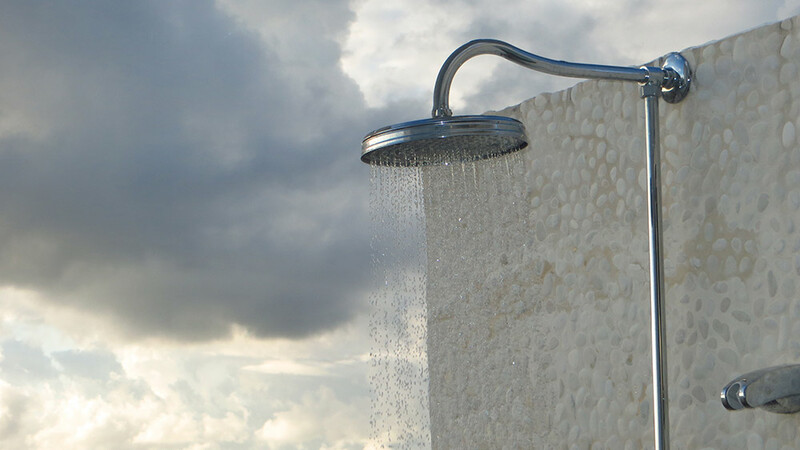 The outdoor Rain Shower, with windows looking out to St. Martin and over to the salt pond (in the Western bathroom) washes away the stresses and tensions of "regular life." 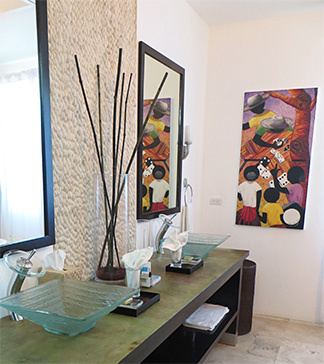 More on Tequila Sunrise Villa's rooms. Tequila Sunrise is exceptionally well designed and laid out. The use of space is smart, without a wasted view. The modern feel and use of whites is nicely offset by bright colors and unique pieces, such as the large, antique door (more on that below). 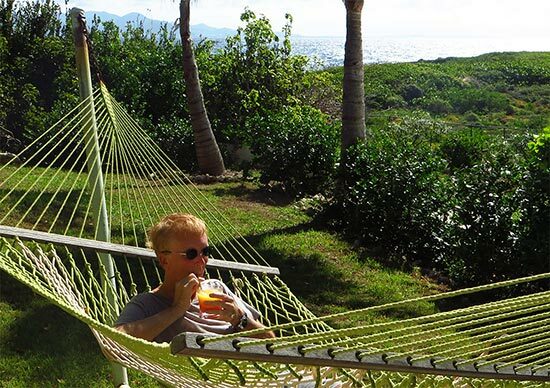 With that in mind, it was no surprise when Kenroy told us that Tequila Sunrise Villa had been professionally designed by one of the world's best, Ian "Sugar George" Edwards. 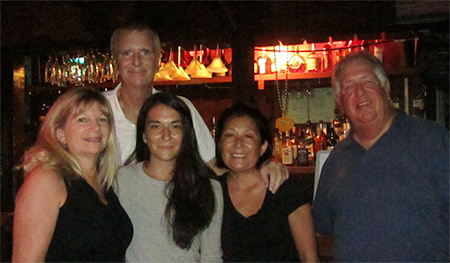 Originally from Montserrat, Sugar George and his wife, Janine, sought out a new home when the volcano started awakening. 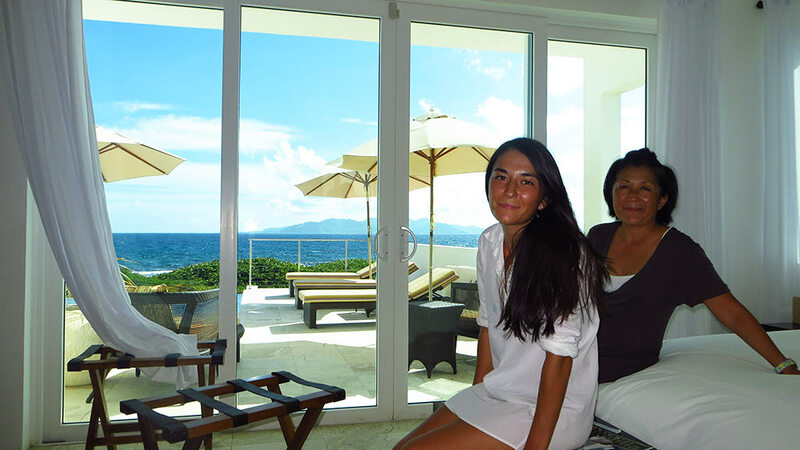 After a couple of years of searching, they finally set foot on Anguilla. They fell in love. A man with a true eye and mind for good design, "Sugar George" is known on a local, regional and international level. He has designed and built some of the most luxurious properties in Anguilla, and throughout the Caribbean. 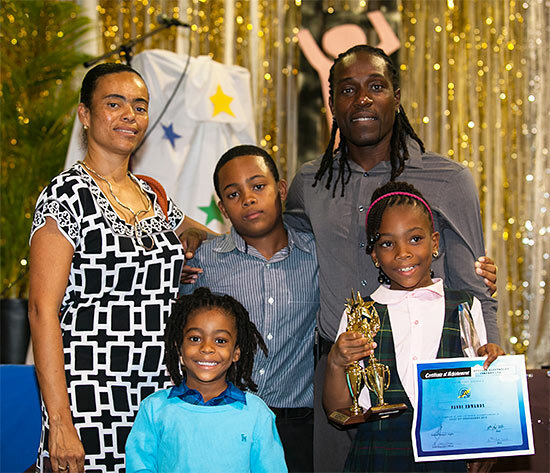 He recently won five awards for Architecture and Property Development from the International Property Awards based in London, where he competed against 2,000+ entries from across the world! 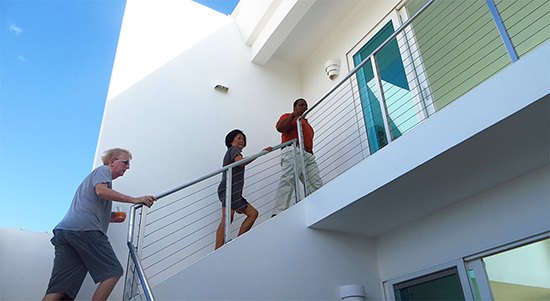 As Kenroy showed us around Tequila Sunrise, it was hard not to notice all of the special touches throughout the villa. 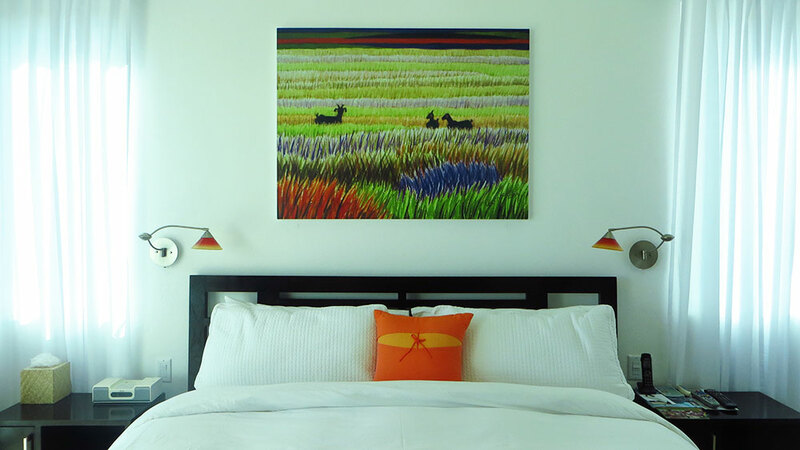 Tequila Sunrise has been thoughtfully decorated, with tasteful pieces that compliment each other. Displays of the Globus' fine taste begin at the front door. 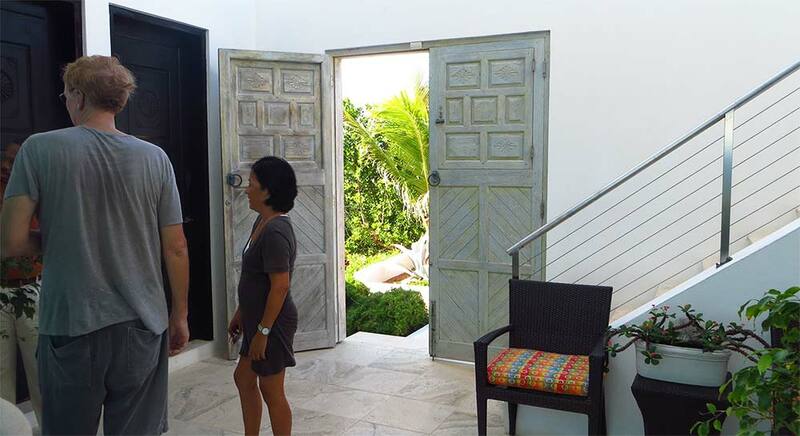 Joel had this large, wooden door custom built in Indonesia! It was modeled after a French farmhouse door. Its rustic look and turquoise shade balance well. Tour completed, we were ready to settle into Tequila Sunrise Villa! Kenroy and Heather asked if we needed anything at all. We were all set! They smiled and said, "OK. You have our numbers if you change your mind." As he unwound in the hammock, my Mom put on her bathing suit. She couldn't wait to curl up on one of the stylish chaises by the pool. 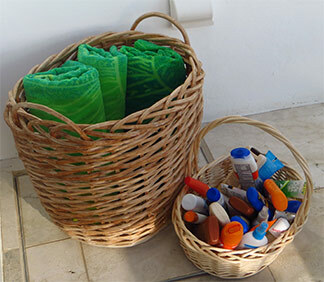 A large woven basket had plenty of huuuuge towels. The smaller basket provides sunblocks ranging from SPF 10 to SPF 45. If you forget to put on the sunblock, it also has aloe vera. No need to worry about packing liquids! iPad in hand (the house is completely wireless), my Mom slid into a relaxed state. The deck captures the sun for most of the day. 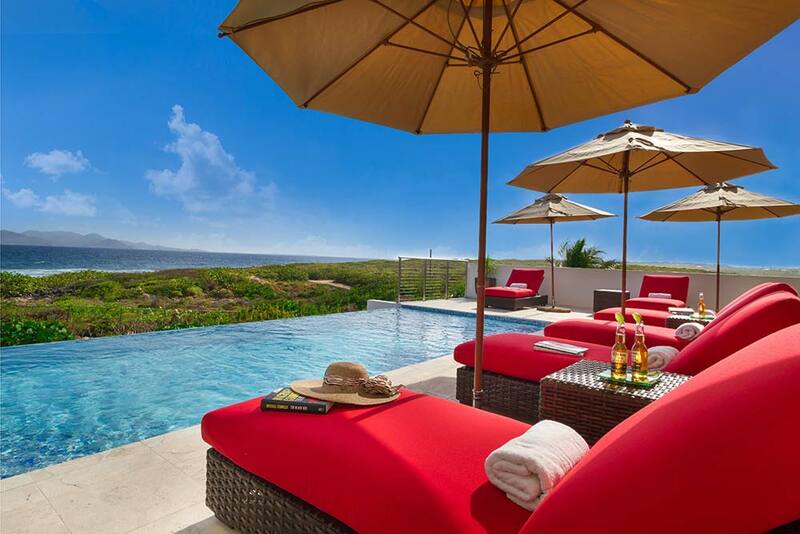 The furniture complements the turquoise pool. Seeing Mom and I relaxing pool-side, Dad was quick to join! Here, you feel completely alone, at peace, undisturbed, truly away from it all. The view is a striking sequence of blues and greens for as far as the eye can see. Important: The pool is protected from the Tradewinds by an Eastern wall, keeping the water at a perfect temperature. That day, I'm not sure what made me happier... the scenery or seeing my parents so relaxed and happy, just soaking up the sun and the moment. 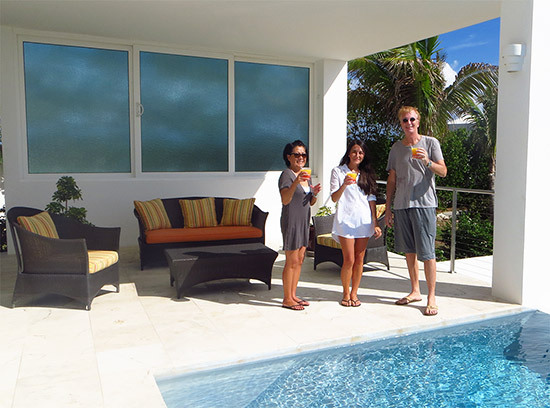 We lounged by the pool, second Tequila Sunrises in hand (just follow the simple recipe in the Tequila Sunrise book). 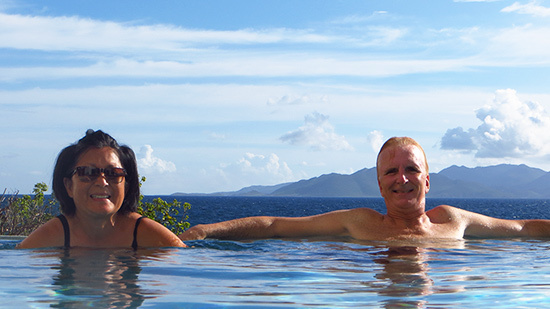 Joel and Robin have definitely thought of everything to optimize pool-friendly afternoons. We finally managed to break away from the pool to take a dip in the Caribbean waters of Dropsey Bay. We had not been to Dropsey Bay in a long time. Remembering it fondly, off we went. More on Dropsey Bay here. Dropsey Bay is just a 2 minute leisurely walk from Tequila Sunrise, down a sandy path. Look what I found on the way? 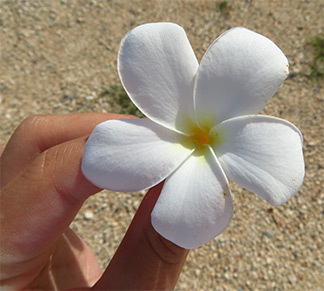 A frangipani flower. 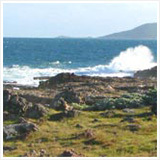 Dropsey Bay has been "known" for years by insiders as a secret snorkeling cove. We discovered it when we first started visiting the island in 2002. 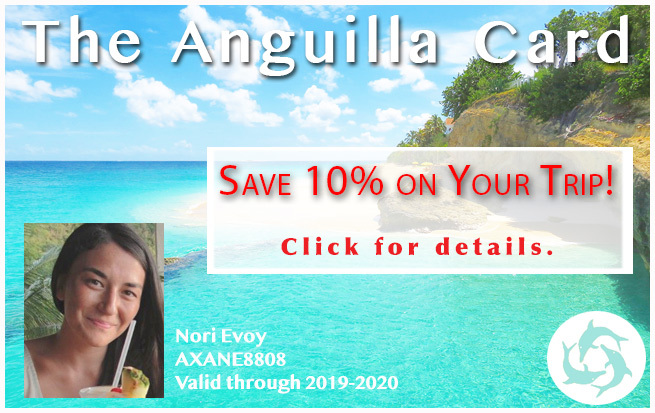 It has the best beginner snorkeling in Anguilla. 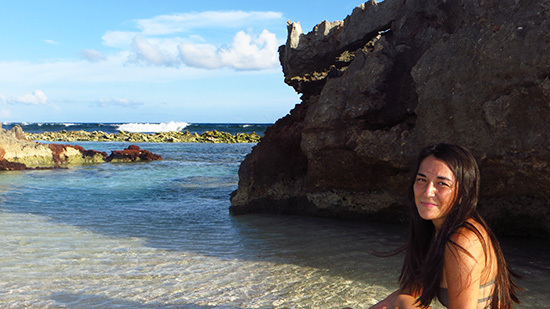 Undisturbed by visitors and protected by a rocky offshore reef, the area is conducive to an active sea life. 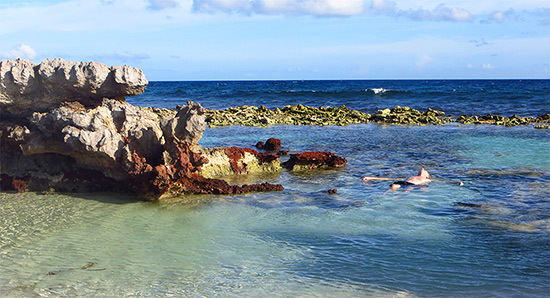 Tip: Snorkeling is best at high tide when the waters are a little deeper. Shallow, calm waters make it good for children, too. The waves break on the rocky reef farther out. It is magical how this little bay can be so peaceful, while waves crash just on the other side of the reef. No other beach in Anguilla has a natural salt water swimming pool. My favorite part of the beach is its western tip. Here, a large rock formation sits, creating a small, exotic-looking cove. Joel and Robin have nicknamed this cove, Lovers' Cove. Having been the site of weddings and proposals, it sure is a spot for the romantics! Special Note: The villa has plenty of beach chairs, bags, umbrellas and snorkeling equipment available for use. With the sun getting low, it was time to head back. My heart always pounds, excited, as the sound of the sea gets closer and closer, and feels so heavy when it is time to part from it. 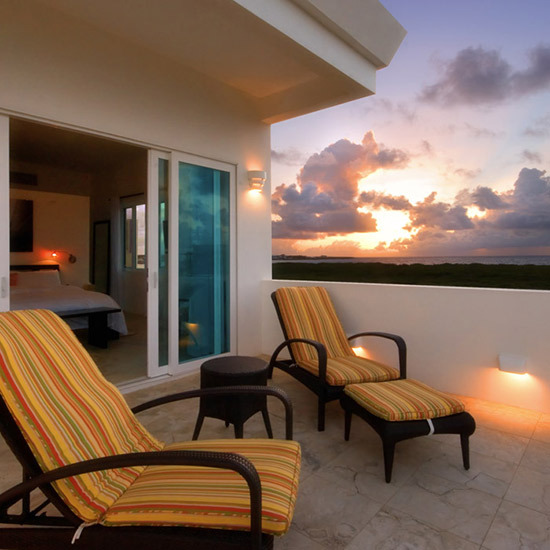 Luckily, the sound and sight of the sea is constant from Tequila Sunrise Villa. The beautiful art of Lynne Bernbaum. 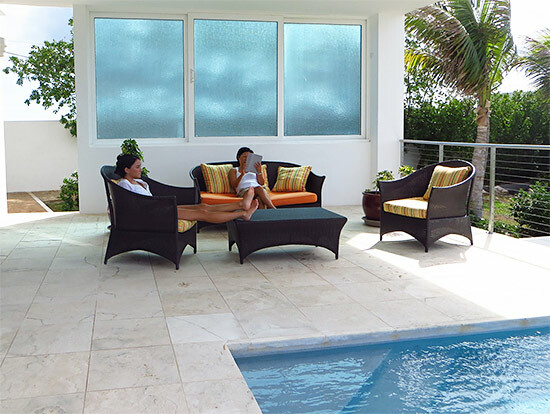 It adds a uniquely Anguilla touch and marries well with the Caribbean modern feel of the entire villa. The artwork, by Lynne Bernbaum, carries Anguilla into the villa. 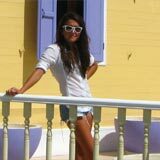 Lynne is one of our favorite Anguilla artists. 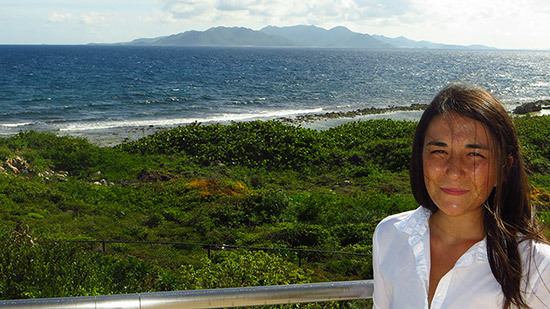 Originally from Dallas, she first came to Anguilla in 1988. Today, Anguilla is home for Lynne. 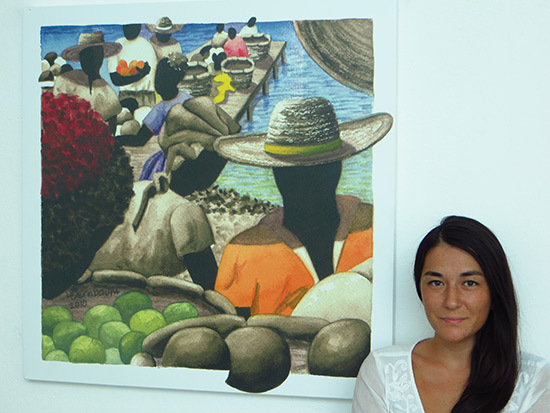 Her paintings are unique, capturing a special feeling of Anguilla. That essence lives in Tequila Sunrise, too. 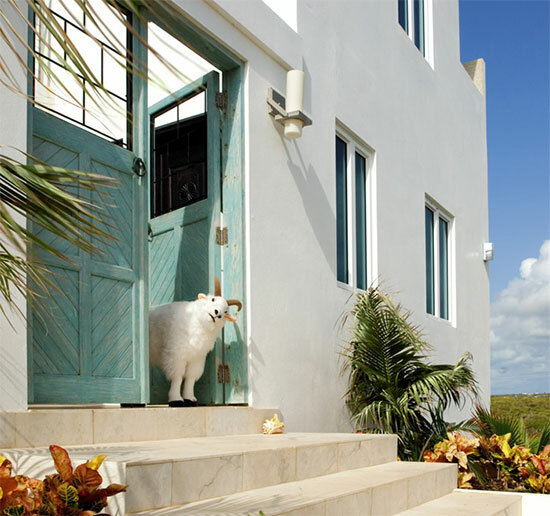 Lynne, a studio artist, is inspired by life in Anguilla and creates Modernist pieces that delight the eye. 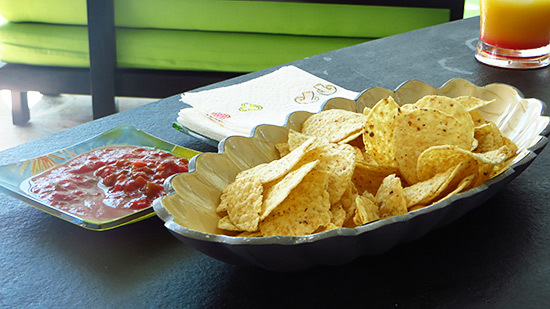 For current specials and promotions at Tequila Sunrise Villa, click here. My Dad finally closed his computer, prepared himself a final Tequila Sunrise, and watched baseball on the large flat-screen in the living room. With the sound of the sea in the distance, and the ocean breeze around him, he was happy and relaxed. My Mom, too, prepared to cozy into her little nook. Before she climbed the stairs, I snapped this photo of her enjoying the open courtyard. She chose the Eastern master bedroom. 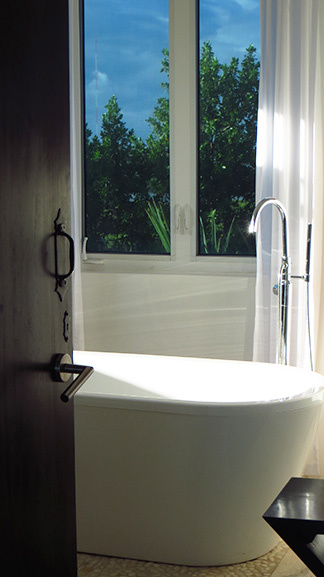 It and the adjoining bathroom has central airconditioning, which significantly cools the bedroom. I spied her snuggled under the down duvet, watching her favorite Pride and Prejudice on Oxygen, she and her iPad were good for the night. Just after nightfall I went outside. The sky was light, cloud formations boldly glided by. Stars twinkled. A shooting star caught my eye. I'm still not sure what is prettier... the night lights of Anguilla and St. Martin that sparkle in the distance, or the stars above? Wrapped up under the down comforter, looking out to St. Martin at night, I, too eventually said good-night to a blissful day. The next morning my Mom and I did more of what we had been doing our whole stay at Tequila Sunrise... we put our feet up! Heather was preparing a full breakfast inside. What more can I say about Heather other than that she is a delightful person and an absolutely talented cook! Kenroy and Heather are the magic behind Tequila Sunrise! 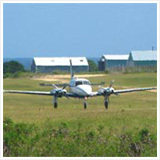 Kenroy is there when you first arrive in Anguilla (or St. Maarten) and will come over anytime you need anything. You feel secure in his safe hands. She is on site every morning. She stays until about 1 or 2pm, every day. Heather prepares your breakfast, makes your bed, tidies your room and even does your laundry! She is genuinely kind and helpful, and unobtrusive. If you need anything, just ask her and she will help. Kenroy and Heather make a stellar team. 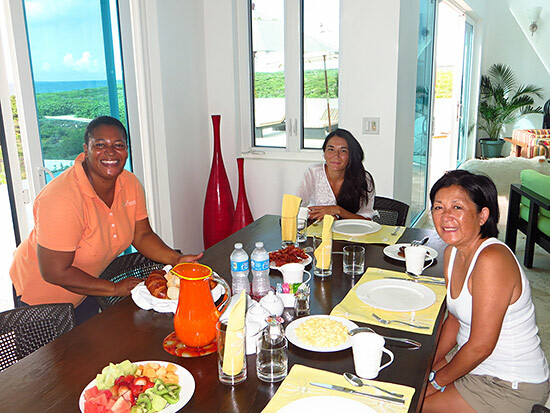 Kenroy (the owner and founder of Leviticus Lifestyle & Travel) is a long-standing and well-established leader in luxury Anguilla villa management, managing some of the island's most luxurious and exclusive properties. 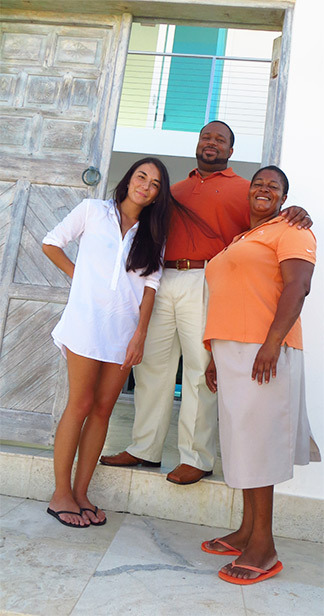 Behind Heather and Kenroy, Robin and Joel's passion for their villa and for Anguilla shines strong, and fuels it all. 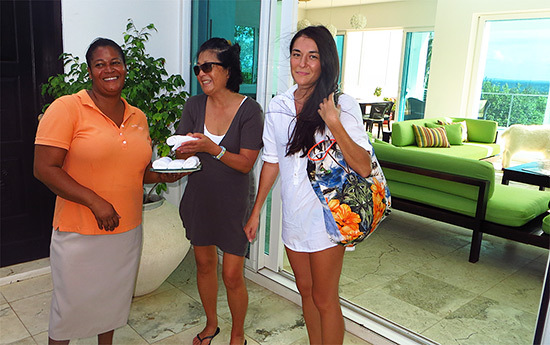 More on the warm staff at Tequila Sunrise Villa. Many thanks to Joel and Robin for their kind invitation. The space, amenities, location and service is all five-star, and at a remarkably low rate. As of 2016, Squareless Routes GPS are also included in your stay. 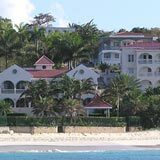 Perfect for days of exploring beautiful Anguilla, Squareless Routes pre-loads their GPS units with every Anguilla restaurant, hotel, villa, all 33 beaches, and points of interest on the island. Just ask for it and it's included in your stay, too! 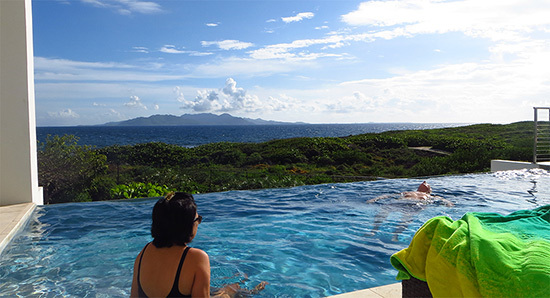 Anguilla is well known for its luxury, but rarely is luxury affordable. 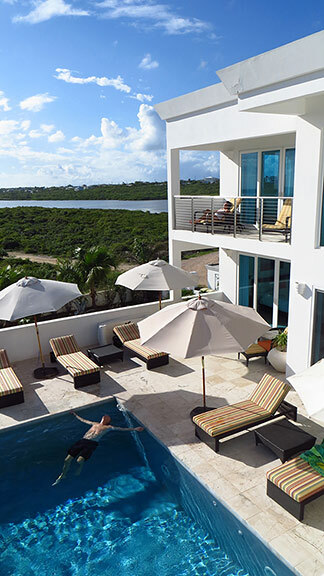 Tequila Sunrise Villa is the best value luxury experience in Anguilla. Staying at Tequila Sunrise feels like having a massive hotel suite at a fraction of the price. 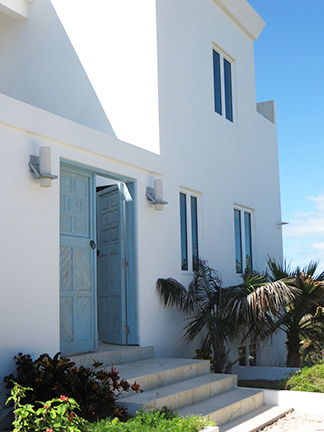 Joel and Robin's story on the construction of Tequila Sunrise Villa.